“The Fox (What Does the Fox Say? )”, also known as “The Fox”, is an electronic dance song and viral video by Norwegian comedy duo Ylvis. 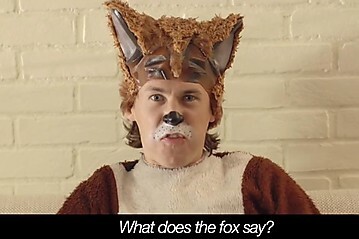 The top trending video of 2013 on YouTube, “The Fox” was posted on the video-sharing website on September 3, 2013 and has over 276 million views as of December 11, 2013. “The Fox” has peaked at number 6 for three consecutive weeks on the Billboard Hot 100, and is also the highest-ranked song by a Norwegian artist on the chart since a-ha’s number-one song “Take on Me” in 1985. Originally an “anti-hit” produced as a promo for the duo’s new season of Norwegian television talk show I kveld med Ylvis (Tonight with Ylvis), “The Fox”, “created to fail”, has ironically and accidentally gone viral, becoming Ylvis’ “breakout” song and drawing international attention to the group. There are currently no plans to release an album including the song or any sequel to it.